Chewandswallow was similar to any other small town except for one thing: the weather comes three times a day and not in the form of snow or rain or wind. Instead, it rained soup, juice, mashed potatoes, hamburgers... It was an idyllic life, until the weather took a turn for the worse. Suddenly, rather than falling in edible, manageable portions, the town was plagued by floods and storms of giant food items, ruining town buildings and endangering the residents' lives. 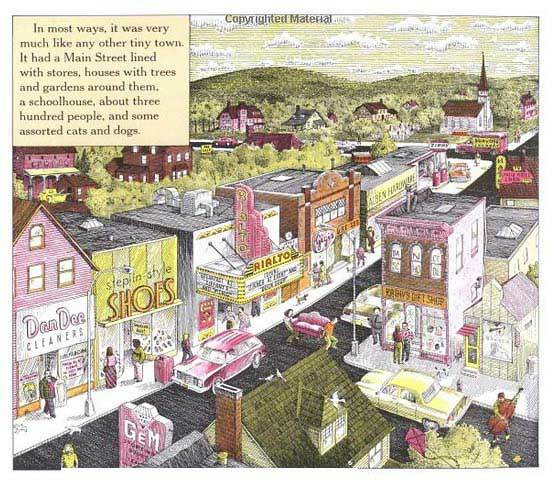 What were the townspeople to do about their weather now? This book is a true classic! Even if your students have seen the recent movie, they'll enjoy the original too. The storyline--about food falling instead of rain--is super clever and the illustrations are fantastic (although the printing is a bit dated). In addition to being a just-for-fun read aloud, this title can be also helpful when teaching compound words. Barrett likely didn't write the book for this purpose, but the text is full of examples of compound words! Sample Pages: Below are two pages from inside this book. 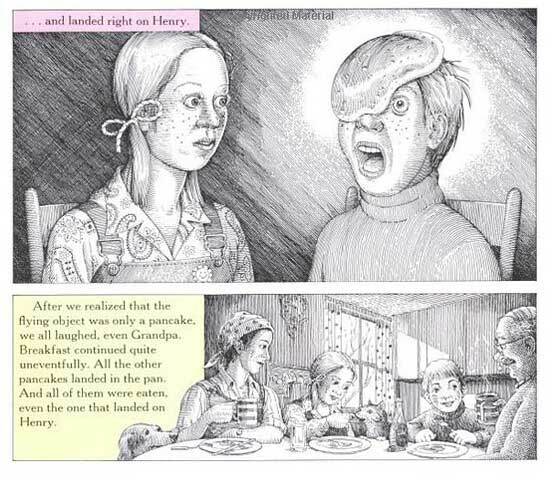 As you can see, there certainly is quite a bit of text per page, but the concept is so funny and clever that kids do seem to stay engaged throughout a read aloud. We know our small samples can be heard to read, so we have included super large versions as well. To see larger versions (readable ones! ), simply click on the images below. There are a dozen lessons to go with this book on this page of the A-to-Z-Teacher-Stuff website and a dozen more on of webenglishteacher.com. And considering what a classic this, there are surely many more. We will look through them soon and pick our favorites. 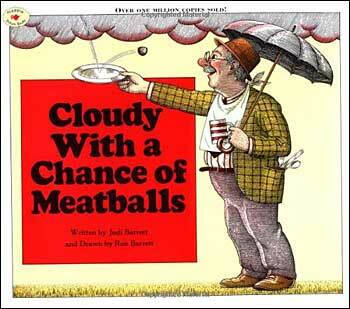 Also, the website I Heart Teaching has a fun activity to do after reading the book Cloudy with a Chance of Meatballs. In short, the teacher taped half of a compound word on each students' back, and then at the signal, the students must interact to find their compound partner. To see the complete write up of this fun lesson ideas (with pictures for each step-- including the one at right), click here.